DLP Planning Ltd has secured Planning and Listed Building Consent, on behalf of the Sir Malcolm Stewart General Charitable Trust, to replace the existing timber single glazed windows with slim profile timber double glazed windows on a number of Grade II listed buildings within the Stewartby Conservation Area. The site comprises part of an open plan estate that was designed in the early 1950’s by the renowned architect Sir Albert Richardson and historically provided housing for the retired workers of the London Brick Company and their descendants. The site now also provides housing for a general population over the age of 55 years. Following pre-application discussions with the Planning and Conservation Officer, DLP Planning Ltd submitted an application and successfully demonstrated that the detailing and design of the proposed windows would match that of the existing windows, and would preserve the significance of the Listed Buildings and the character and appearance of the Conservation Area. The Council agreed that there would be no harm to these heritage assets. The comprehensive replacement of the existing windows with new double glazed units provides for a step change in energy efficiency by eliminating draughts and retaining heat as well as improving the ease of operation for the elderly residents and cutting future maintenance and repair costs. The decision has been welcomed by the Trust and by the residents who will benefit from the improvements. DLP Planning Ltd have successfully secured planning permission for the change of use of a unit at Battlers Green Farm, Radlett, from retail (Class A1) to a veterinary practice (Class D1). Planning permission was also secured for the signage required for the practice. The proposal will see the re-use of a vacant building within the Green Belt and will support the expansion of an existing practice, Fernside Veterinary Clinic, based in Borehamwood. The site provided a number of constraints, including its location outside of the settlement boundary of Radlett, which is also within the Green Belt, and the fact that there are three Grade II heritage assets on site. Working with BE1 Architects, the scheme was sensitively designed to ensure that the setting and the significance of the Grade II buildings would not be affected. A heritage statement was submitted to Hertsmere Borough Council to demonstrate the acceptability of the scheme and that there would be no harm to the historic interest of the assets. The Council agreed with the evidence provided, which demonstrated that, in accordance with Paragraph 146 of the National Planning Policy Framework 2018, the scheme would not constitute inappropriate development in the Green Belt. The development would re-use an existing building, there were no extensions or increase in built form and there would be no detrimental impact on the openness of the Green Belt. The scheme did not receive any technical objections and was approved by delegated powers. 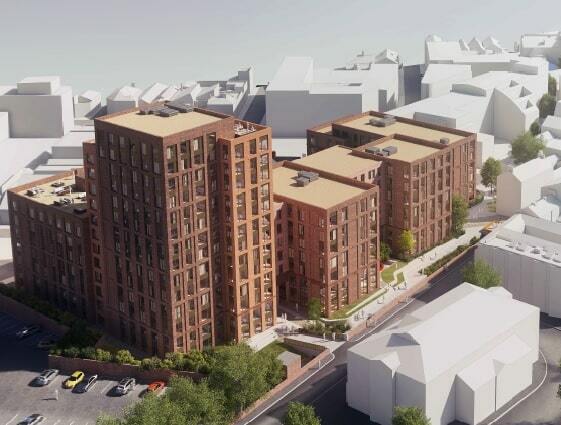 On behalf of Platform_, DLP Planning have secured permission for Sheffield’s first build-to-rent (BTR) development of 335 apartments within the Cultural Industries Quarter area of the city centre. The development includes three blocks of between five and 14 storeys in height, providing studio, one, two and three-bed apartments as well as co-working employment space and a flexible use commercial unit. Communal facilities including a gym, common room, cinema room, dining facilities, amenity space, roof garden and bike maintenance store area will also be provided. The proposals also include the creation of a formal riverside walkway alongside the Porter Brook. This long-term vacant brownfield site presented a number of challenges relating to its Conservation Area status, site contamination and flood risk. Working alongside Tate Hindle Architects over an 18 month period, DLP promoted a sensitive design approach, which also sought to respond to comments from Historic England, in order to secure officer support for the proposals. As a result of the substantial costs associated with the development and the limited evidence of comparable market values, it was also necessary to undertake negotiations with the LPA in respect of the viability of providing affordable housing. As a result of negotiations, officers considered that the proposals provided substantial public benefits that could be considered to outweigh the less than substantial harm caused by the scale of development. The proposals were subsequently unanimously approved by Planning Committee members.